Type locality: Ceylon (Sri Lanka). 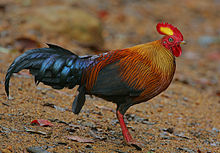 For more multimedia, look at Gallus lafayettii on Wikimedia Commons. This page was last edited on 28 January 2019, at 05:32.